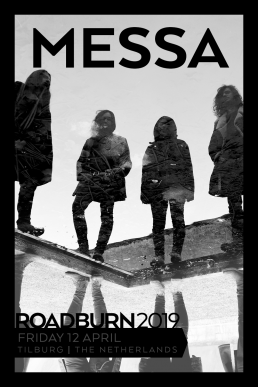 Messa bring a ceremonial feast to Roadburn 2019! With their second record, Feast for Water, Italy’s Messa proved once again they’re more than just a great logo. We’re proud to welcome them to Roadburn Festival for the first time in 2019! Feast for Water, preceded by the four-piece’s 2016 debut, Belfry — as in, where the bats are — is an anti-genre work of richly atmospheric weight. Taking elements from black metal, heavy rock, doom, jazz, ambient psychedelia, cult and goth rock, songs like ‘Leah’ and ‘Tulsi’ offer transcendent spaces for the listener to dwell within. It’s a sonic journey we can’t wait to take when Messa perform a special set as part of next year’s festival. The keyword there is “mood.” Dark as they can be, Messa are a bright spot in Italy’s booming heavy underground, with an immersive style, entrancing melodies, and a path that is truly becoming their own. Oh, and that logo is pretty sweet, too. Messa will perform as part of Roadburn 2019 on Friday, 12 April.